It is not uncommon for companies and websites to transform and re-brand themselves. Sometimes, this is just a new look, but when a new name, perspective and business model are involved, then you need to consider the wider implications. With SEO, for instance, there is a lot to consider. If you’re company was originally called A, and is now called B, what happens to the existing links you’ve worked to produce? Google will still fetch them up from the relevant keywords, but if they mention your company by name they might not make much sense to the user. Of course, this ultimately isn’t a problem if you deploy the right SEO services and strategies. 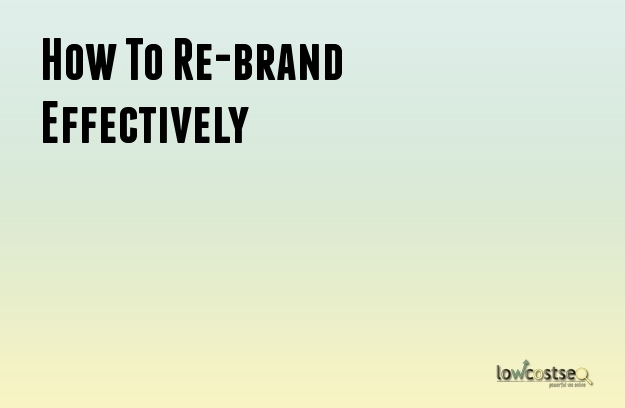 Here are a few things you need to consider for an effective re-brand. If your keywords aren’t related to your website – which is true in the vast majority of cases – there is often very little to do. However, if your re-brand involves introducing new products, topics or themes, as well as dropping old ones, than you need to do some active keyword analysis and hunting. If you’re a supplier of edible goods, for instance, and you’ve re-branded with all natural, organic products, then you would want to avoid keywords that actively discourage this. So, if you’ve stopped selling “frozen vegetables”, for example, these links aren’t going to do you any favours. While it might put some people off, Google could also (in some case) rank your website down as a result. Are Their Implications For Your New Name? Your new name is a term that comes up in another industry or niche. In most of these cases, some wise SEO can ensure there are no problems. If you’re worried about infringing on other industries or companies, just be sure to have an SEO campaign that actively stays clear of these areas, as it should. Social media is your main interaction with online users, so be sure to include social media in your rebrand. Change all your accounts to reflect the new name, and actively mention that “company A is now re-branded as company B”. This way, aside from the appreciated honesty, nobody will be confused and assume they’ve gone to the wrong site. The same can also be said for your e-mail campaign. It doesn’t take much to inform your existing, regular customers about the change. Finally, don’t delete or give up the old URL. Depending on the nature of your website, you might have daily, weekly, monthly or even yearly visitors. The longer between visits, the longer it is before they notice the re-brand. Surely it’s better to keep the old URL up, with a re-direct, so they can still be part of your site?